You are here: Home » Forex Trading Academy » Introduction to Forex Trading » Why Using an Economic Calendar is Important? 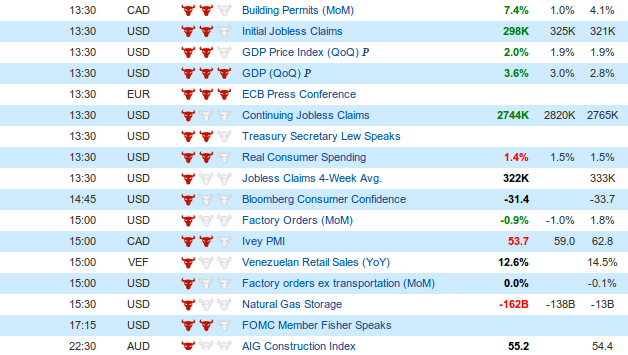 What to look for in an economic calendar? How to deal with data? If you have any questions or suggestions you are welcome to join our forum discussion about Why Using an Economic Calendar is Important?. One tool, key to a success when trading Forex is the economic calendar. By using the calendar a trader will get a better understanding why the market is moving in a certain way, while at the same time, he/she will be able to anticipate these moves. As a whole, the biggest market-moving events tend to be the release of key economic data such as the GDP, US non-farm payroll number. While not all of the reactions of the market to these announcements can be predicted they do present excellent trading opportunities. Experienced traders examine future economic events on a daily basis in an attempt to predict the movement of a particular currency pair. They usually stay way ahead of the announcements of crucial events and get into action in a respective way, so that by the time a certain announcement is made, they will have already estimated the value of the currency pair they are interested in. A simple, but effective way for traders to keep track of information from events, news or statements is to have an economic calendar at their disposal. By using such a vital trading tool, traders are able to follow key economic and non-economic indicators, which may provide clues of the direction of the market and also be aware of all the events, expected to influence the movement of a particular currency. There are several ways to keep an economic calendar. The most common is to have an online calendar platform available, which updates data in an automatic way and immediately present all the information to users. When looking at such a calendar a beginner trader will most likely notice that all the available information is arranged in several columns by country, name of the indicator and influence (or importance) of it, as well as current period value, forecast value and value regarding a previous period. We should note that different countries have various influence on global markets. For example, because during the past decade, almost two thirds of the total Allocated foreign exchange reserves of countries worldwide have been denominated in US dollars, this currency is known to have a reserve-currency status. As the United States accounts for a huge proportion of global currency trades, major economic events and statements coming from the U.S. usually cause the most considerable influence on the currency market, often even on currency pairs, which do not include the US dollar. There are two types of indicators considering the time aspect they reflect that every trader needs to be aware of: leading indicators, which often change prior to large economic adjustments and, as such, can be used in order to predict future trends; lagging indicators, which reflect economy’s performance in the past, while changes to these indicators are identifiable only after an economic tendency or pattern has already been formed. An example of a leading indicator is Retail Sales while lagging indicators include the Unemployment Rate. Furthermore, indicators are usually classified in three groups by the impact on the economy, and respectively, volatility they may cause. Each economic calendar platform has chosen its own way to grade the economic indicators. Investing.com has structured its own economic calendar by rating those indicators by volatility they might cause in the market. An indicator of utmost relevance is a nation’s GDP (Gross Domestic Product), as it gauges the value of all goods and services produced in a particular country. PMI (Purchasing Manager’s Index) monitors manufacturing activity and is also regarded as an indicator of a higher influence. Among other closely watched indicators are Initial Jobless Claims, Unemployment rate, Consumer Confidence Index, Home sales, Durable Goods Orders and more. We shall discuss them all in the next chapter of our guide. Less significant, but yet still influential data is provided by indicators such as Housing starts, the Beige Book report, Business Inventories, Factory Orders, Average Hourly Earnings, Federal Budget Balance, etc. Another two keenly anticipated indicators for Forex market analysis are the Producer Price Index (PPI) and Consumer Price Index (CPI), which reflect the average price levels for producers and consumers of goods and services. These are considered as the most preferable measures of inflation rate in a country. Traders usually compare current period figures with those regarding the preceding period, while also taking into account analysts’ estimates for the specific data. By putting these three figures together, traders become aware whether new data disappoints or exceeds expectations, which will determine their next move in the market. Economic announcements and political news can also introduce a change in the direction of a particular currency pair, sometimes even within a matter of seconds. By using the economic calendar, a trader may be aware of a possible change faster and act more rapidly than other participants in the market. When a trader knows that the release of a particular report is imminent, his/her first decision should be whether this release will trigger volatility and whether it will be high. A trader’s response to an announcement relies very much on where he/she has positioned himself/herself and where he/she has placed protective stops. This explains why leading indicators appear so important for one’s decision. Traders are able to profit when they have information in advance, because this enables them to project the possible direction of a currency pair they are interested in. Once you gain more knowledge of the Forex trading basics, you will be prepared to go to the next level and understand in detail each one of the most important economic data released each trading day. The guide will take you through each closely watched economic indicator by analysts, explaining how it is related to the whole picture.